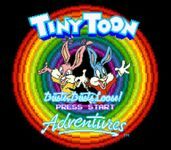 Tiny Toon Adventures: Buster Busts Loose! (released in Japan as simply Tiny Toon Adventures) is a video game for the Super NES console that is based on the animated TV series Tiny Toon Adventures. It was published, developed and released by Konami in 1993. This game features Buster Bunny in a side-scrolling adventure that takes place in many different areas. The game has three difficulty settings - "Children" (easy), "Normal", and "Challenge" (hard). On the easy mode, the levels are significantly reduced in size (as noted in the synopsis below), while the hard mode has Buster start each level with only one health unit. The player must have the L and R shoulder buttons set to command "Dash" for the player to advance beyond the train level in the second stage. Otherwise, Buster will walk off the train car before getting to the jump which will lead to the train to met up with Montana Max and the player will lose lives. A fan patch has been coded to address the issue. To have access to all the mini-games (and not need to spin the wheel, although it is an option) go to the password screen, and input Elmyra in the first box, Shirley the Loon in the second box and Calamity Coyote in the third box. In the opening for the second stage, Buster tells the player that the top L and R buttons are used to dash. This does not change despite the fact that control scheme is customizable. There are no other instances in the game where an action button for a certain move is explicitly stated. Unlike most SNES games, the A Button is not used at default, although the commands can be switched in the OPTIONS menu.